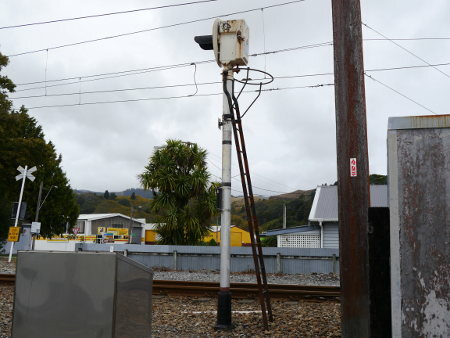 Over the past few years there has been a program to replace searchlight signals with LEDs in the Wellington metro network. 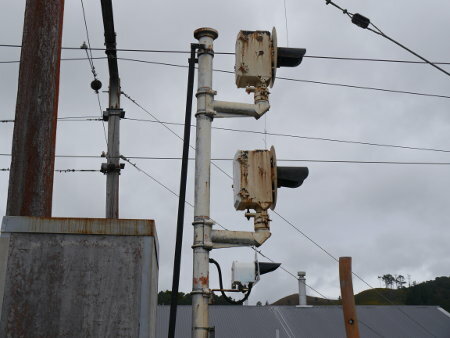 By April 2014 there were just thirteen operational searchlights remaining in the Hutt Valley and five in the Wairarapa at Featherston. 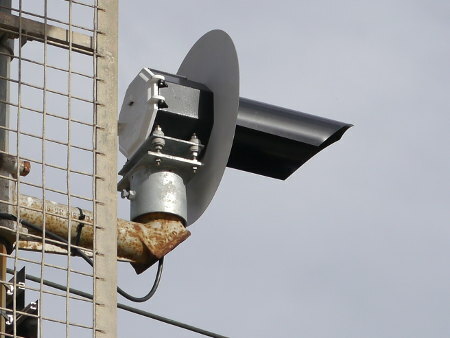 There are also "out of use" gantry mounted searchlights at Epuni and Taita. 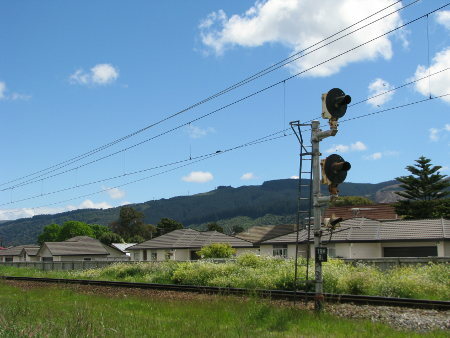 The searchlight signals have been a feature of the network since the electrification of the Hutt Valley line in the 1950s. On this page I document the remaining searchlights. I may add information on their fall. 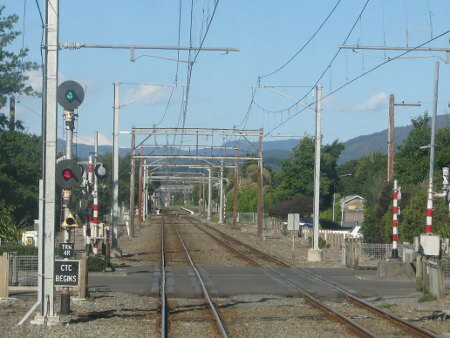 The signals at Trentham, Wallaceville and Upper Hutt are MVGRS. Those at Featherston are Westinghouse Brake & Signal Co Ltd. 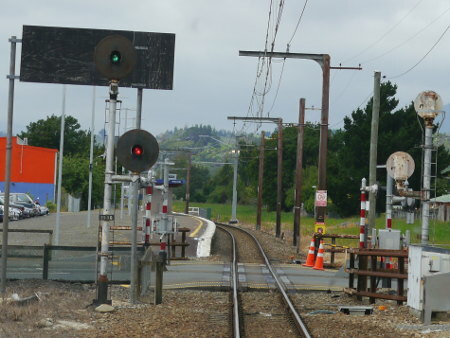 Note that at Petone two tri-colour signals are mounted on gantries. From a distance they may appear to be searchlights but they are in fact LEDs. In October 2017 I noticed that the Trentham 4R Up Home had been painted. This is the first known activity in over three years. I am guessing that a gang had some spare time on its hands and painted the signal to look productive. Otherwise no changes to report - all searchlights remain in use (15/10/2017). 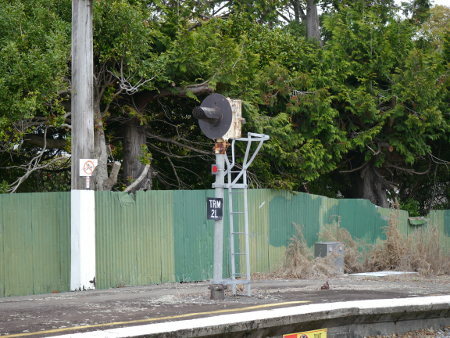 An MVGRS searchlight signal at Wallaceville. 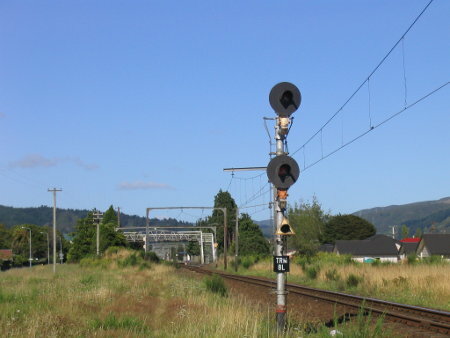 In May 2014 4R Up Home was the only searchlight signal at Upper Hutt. Trentham searchlights were made by Metropolitan Vickers GRS Ltd (MVGRS). GRS was the General Railway Signal Co (UK). 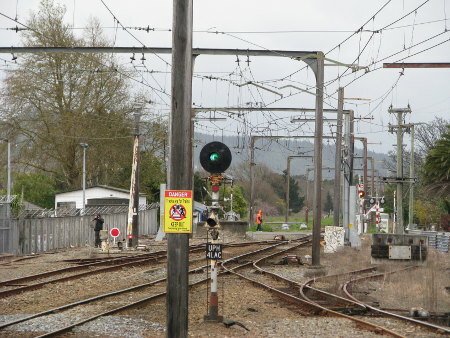 2786 Up intermediate at Heretaunga. 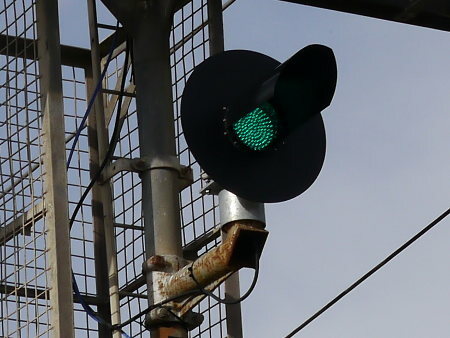 This signal can only be photographed from a train. 4L Down Starting From Main. 2L Down Starting from Loop. Looking south these are the Down Starters, 2L from the Loop on the left and 4L from the Main on the right. This is the single line to double line junction. Looking north these are the Up Departures - 8RA from Main on the left and 8RBC from the Loop on the right. The Down Home is in the distance. 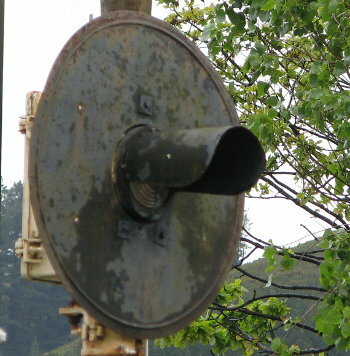 Wallaceville searchlights were made by Metropolitan Vickers GRS Ltd (MVGRS). GRS was the General Railway Signal Co (UK). 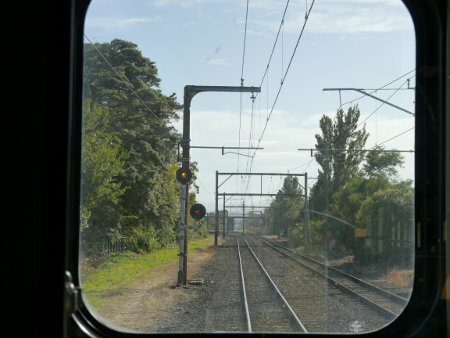 A driver's eye view of 3116 and 3117 intermediate signals at the Ward Street crossing (Wallaceville) from a train to Upper Hutt. 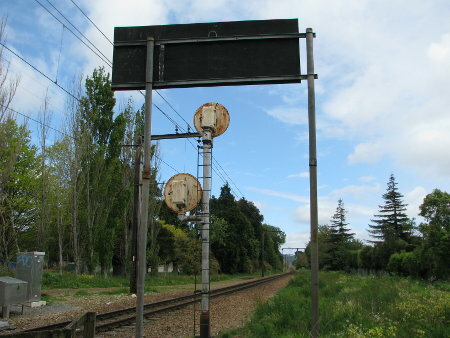 The black board prevents read through to the Upper Hutt Up Home signal from Trentham. 3117 down intermediate at Wallaceville. Upper Hutt searchlights were made by Metropolitan Vickers GRS Ltd (MVGRS). GRS was the General Railway Signal Co (UK). On Monday 9th May 2014 I noted that 8L Down Home, 4LAC Down Starter and 2L Down Departure were LED. 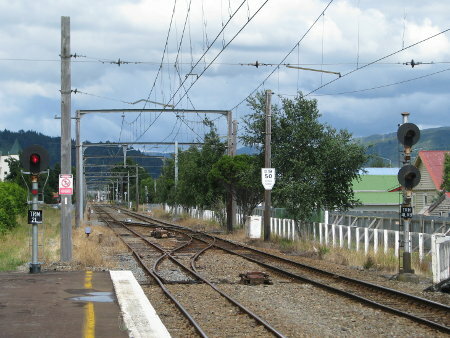 There had been a Block of Line in the Hutt Valley the previous Saturday and Sunday. This leaves 4R Up Home as the only searchlight at Upper Hutt. Upper Hutt 4R Up Home and 2L Down Departure signals near the 32km peg. Upper Hutt 4R Up Home. 8L Down Home. 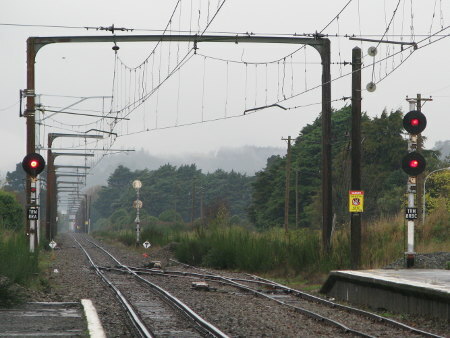 This was the scene in 2007 - lineside vegetation prevented me taking a photo in 2014. In the background work has begun on a "big box" retail development on part of the old Upper Hutt rail yard. 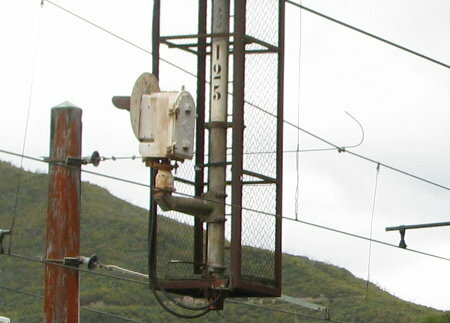 The rectangular case identifies this as an MVGRS signal. 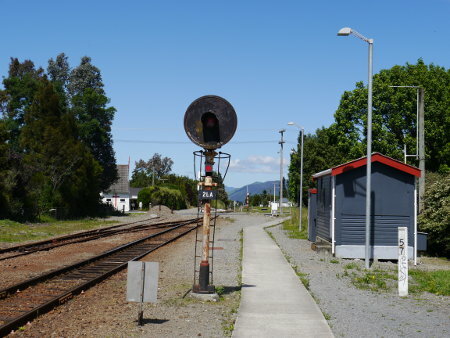 Featherston searchlights were made by the Westinghouse Brake & Signal Co Ltd.
2LA Down Departure from Main at the 57km peg. 2LB Down Departure from Loop. 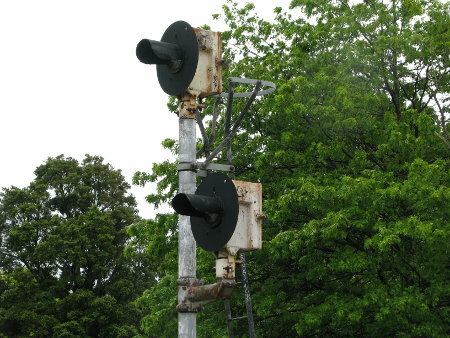 The Down Departure signals wwere made by the Westinghouse Brake and Signal Co Ltd. Note the cylindrical extension between the body and the lens and hood. The pointed top to the case identifies this as Westinghouse Brake & Signal Co Ltd searchlight head. 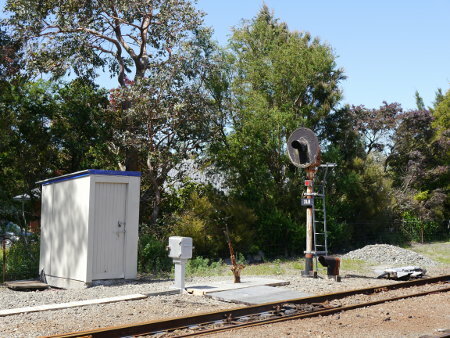 Searchlight signals at Epuni and Taita were made by the Siemans and General Electric Railway Signal Co Ltd (SGE). 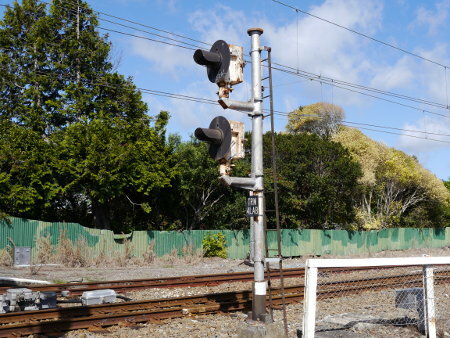 These signals are out of use. 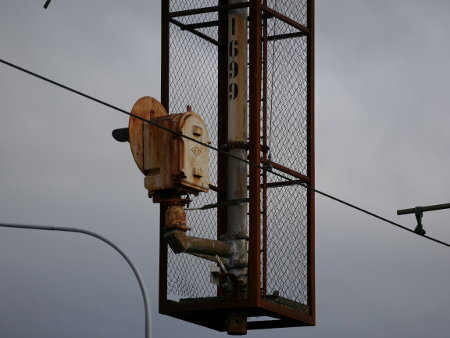 1699 intermediate signal just north of Epuni was a gantry mounted searchlight. 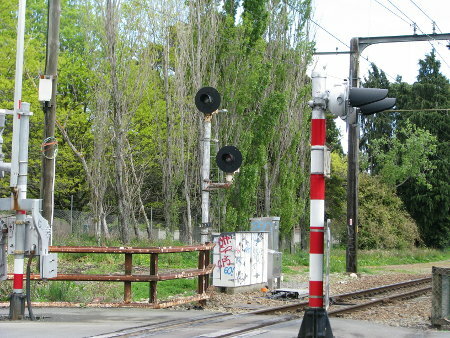 It was replaced with an LED signal some years ago but in April 2014 remains in place "out of use". 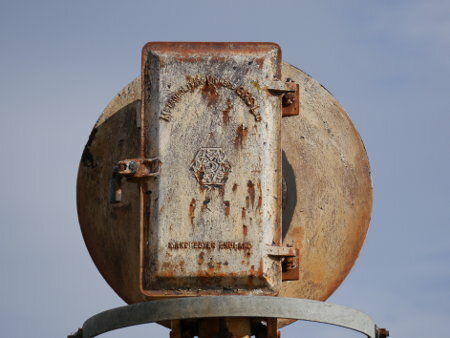 The smooth curved top of the case identifies 1699 intermediate signal (just north of Epuni) as an SGE searchlight signal. 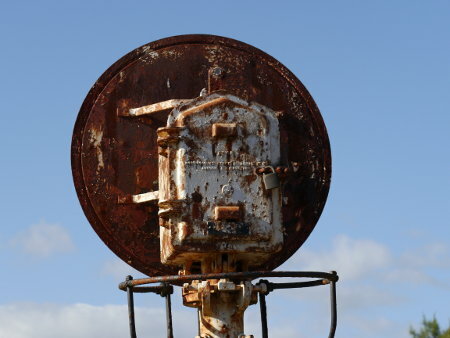 In April 2014 it is one of two SGE searchlight signals (albeit out of use) extant in the Hutt Valley. 125 Down Starting at Taita was a gantry mounted searchlight signal. 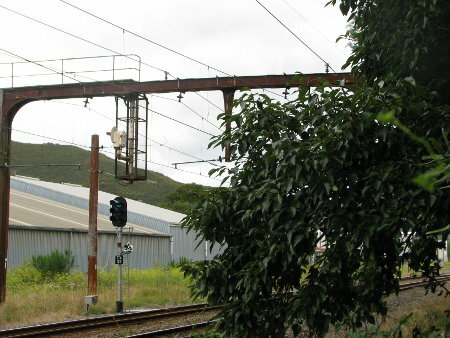 It was replaced with an LED signal some years ago but in April 2014 remains in place "out of use". 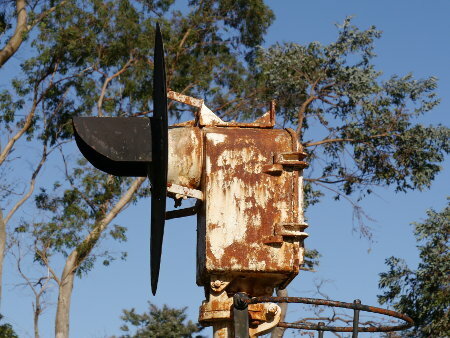 125 Down Starter at Taita out of use. 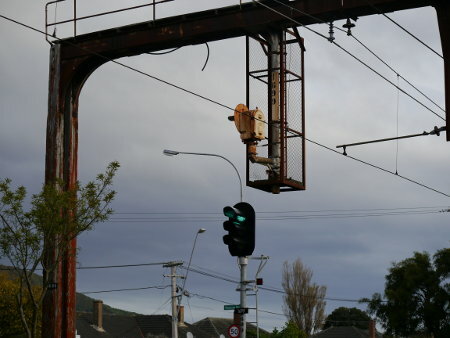 When Petone was re-signalled in 2013/2014 gantry mounted searchlight signals 74 on the down main and 10 on the up main were replaced with tri-colour LEDs. 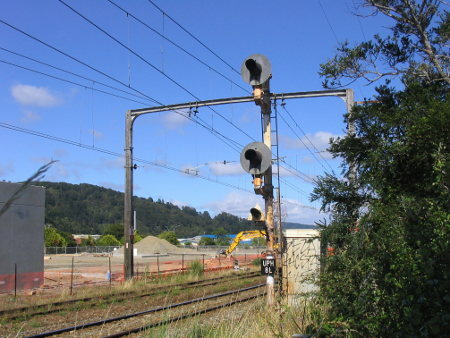 All other signals at Petone became three-light LEDs. This is 206 Up Directing (was 10 Up Home) signal. 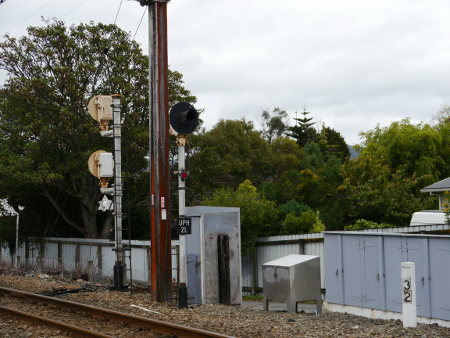 Petone 206 Up Directing signal. Clearly NOT a searchlight.